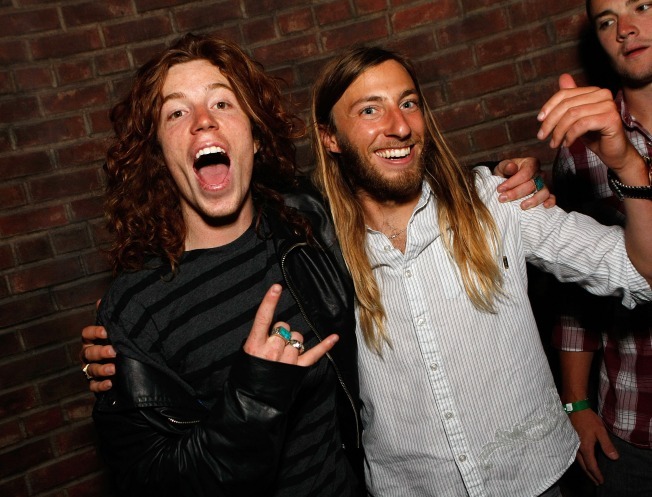 Shaun White, left, will probably dominate this upcoming Thursday's rail jam at East River State Park. As the city hunches its shoulders under an expected 4 inches of snow today, a 90-foot snowboarding jump is rising in East River State Park, "a structure that officials are calling the largest ever built for a special event in the New York City parks," says the Times. Its purpose? To serve as the launching point for 16 of the world's top snowboarders in Red Bull's Snowscraper's competition on February 5th, aiming for a chunk of its $100,000 purse. It will also be the main draw of Winter Jam NYC, the annual snow-fest scheduled for the 5th and 7th. On the 5th, gates open to the public at 3:00pm and all 16 riders practice hitting the kicker at 4:00. Then, at 6:00, the contest starts, formatted as a 60-minute jam session, meaning there's no first rider, there's no last rider, but everyone takes as many runs as possible in the allotted time. Then, at 7:00, local band Anthrax performs, followed by the 8:00pm jam session finals, featuring the top 8 riders. The event concludes with a 9:00pm award ceremony. If you wanted to see it all go down, but can't make it across or downtown, the competition will stream live exclusively at GO211.com starting at 6pm, or just tune in to MSG TV at 8pm for the concert and finals. Finally, you can watch the whole event replayed Sunday, February 15th starting at 5pm EST on NBC. Riders set to attend include Olympic Gold Medalist Shaun White, Travis Rice, Pat Moore, Kevin Pearce, Mikkel Bang, Danny Davis, Kohei Kubo, Kazuhiro Kakubo, and snowboard legend (seriously, don't miss him) Terje Haakonsen. Other confirmed riders, according to the event's site, include Nitro's Andreas Wiig, DC's Torstein Horgmo, Forum's Jake Blauvelt and Greg Bretz, along with Rome rider Bjorn Leines and Ride's JJ Thomas.